Would you agree that engineering activities, design practices and art for Prek-12 are among the coolest ways to get kids scientifically educated? This century has witnessed several innovative methods of education and this is (STEAM/STEM Education) one of the better ways to do it effectively. In the cross-disciplinary convention of STEM and STEAM, books and toys have played a vital role to motivate our kids and to find out about science, nature, engineering, and math. So what’s new and interesting in 2018? What should we as educators and guardians look out for? I have put together a list of the BEST books and toys to make 2018 fascinating and ultra smart. Why STEAM or STEM Books? Picture books and fiction essentially concentrates on influencing kids through imagination and literature. But STEM books urge kids to relate learning to the practical world. Finding connections and meaning in our daily lives and actions. Science, technology, engineering, art, and math assume parts in our lives and these books encourage young learners to go out there and tinker. Here are some of the TOP 5 STEM and STEAM books for your kids in 2018. STEAM AHEAD! 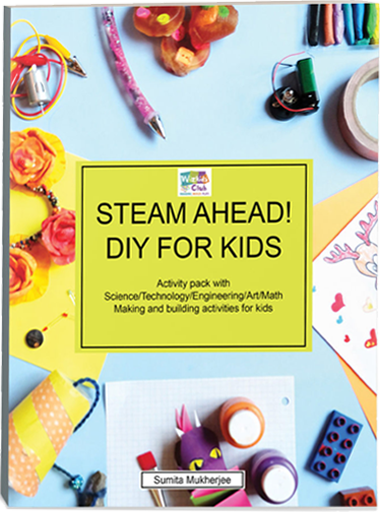 DIY FOR KIDS is a stunning book loaded with hands-on exercises. With awesome Science, Technology, Engineering, Art and Math project ideas, it is an easy way to entertain any bored kid! A great way to acquire 21st century skills and STEM learning. Keiko, Kenzo and Eji are in the clamoring city of Singapore to go to their cousin sister, Kiara’s presentation on an Ancient Sea Trade. Keiko and Kiara find a shrouded treasure note in an old urn. Their curious nature drives them into a fortune chase. Before long they understand some underhanded fortune seekers are out to get them. Discover what happens when they race to chase the submerged fortune under the South China Sea. How they build and create to unravel the mystery. Comprehensive book with hands-on experiments and science woven into the adventure. An awesome Pre-school, Kinder garden pack. 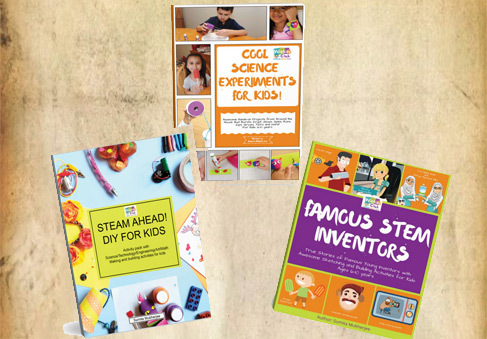 A collection of 4 books to stimulate young minds into STEM and STEAM activities. This Pre-school pack is This book encourages comprehensive learning for young kids. It is scientific, informative and creative. It is about water cycle stages, vocabulary and words, experiments, quiz, games and many more. This book gives complete understanding about water cycle through hands on learning and activities. A fun activity book filled with quiz, facts, information, illustration, sorting, question-answer key and various other activities. Generating ideas and stimulating the whole brain. SIMPLE MACHINES AND FORCES is an astonishing book loaded with hands-on exercises. Find out about straightforward machines and powers by building them; utilizing simple materials from around the house or stores. It will create fun with Science, Technology, Engineering, Art and Math venture thoughts. It is an extraordinary approach to get 21st century abilities and STEM learning. This book introduces kids to the world’s most famous young inventors in the field of S.T.E.M (Science, Technology, Engineering and Math). All things that we enjoy are a product of brilliant minds, scientists and engineers. This book imparts information that is interesting and engaging to young boys and girls between 6-10 years age. Kids will be transported to the fascinating world of famous creators and learn about their first inventions: Glowing paper, Popsicle, Windsurf board, Television, Earmuffs and more. The book arouses their natural curiosity to be inspired from their role models. It showcases the Engineering Design Process behind every invention. Highlights what they invented and how they invented, thereby, revealing the steps to all new discoveries. It encourages kids to sketch and design their own ideas through the design activity. This book prompts kids to think creatively and it arouses their natural curiosity to build, make and tinker. Getting your kids brains to workout on a regular basis calls for everyday stimulation. Apps, technology, machines and artificial intelligence is a big part in our lives and we know the advantages of having it. Who do you think makes this difference? Of course we are talking about Engineers. Our future forecasts a drastic growth in engineering jobs and technology. It is incumbent to get kids excited about it from an early age so that they remain lifelong learners. This is why learning and educational toys are so critical in this day and age. Fortunately it doesn’t imply that they should give up on their fun time, in fact STEM toys intend to instruct kids by heightening the adventure and thrill. STEM toys have made a considerable progress in 2017, and we’re seeing huge amounts of new coding toys, science toys, and math toys become a part of regular play. The Motorized Art Bot is an exceptional hands-on activity for students in grade 1 through eighth grade. Students will figure out how to use mini motors with battery to make moving bots. This activity will make use of their creative energies to build a spinning toy, make a stuff toy move or build a new artbot. Include a couple of markers, stick the bot on a paper cut and watch it rattle and draw spirals. This activity can be effectively consolidated during the time – make Spookybots for Halloween, Turkeybots for Thanksgiving, Prezbots for Presidents’ Day, Lovebots for Valentine’s Day and the rundown goes on! This Wearable Tech Kit provides the necessary tools to engineer sewable circuits into DIY arts, crafts and fashion tech projects – from LED light up scarfs and leggings to pressure sensors for wearables – all designed for ages eight and up. Making slime is fun right? That sticky googey oobleck? This is something that keeps children and young immersed in it alike. As indicated by CNBC, the craze of making slime with glue is widespread to the point that stores are fighting to keep SLIME loaded. SLIME making is a great way to keep kids working with their hands for considerable lengths of time. Squishy Circuits are a fun way to teach kids about electricity and conductivity. It utilizes conductive and protective play mixture to understand the essentials of electrical circuits in a fun, hands-on way. Simply include batteries and with the pre-made mixtures (or make your own particular mixture with the given formulas), let your manifestations take form as they light up with LEDs.